Maestro George Yore (left) and Master Keenan Williams (right) working on a double stick pattern. 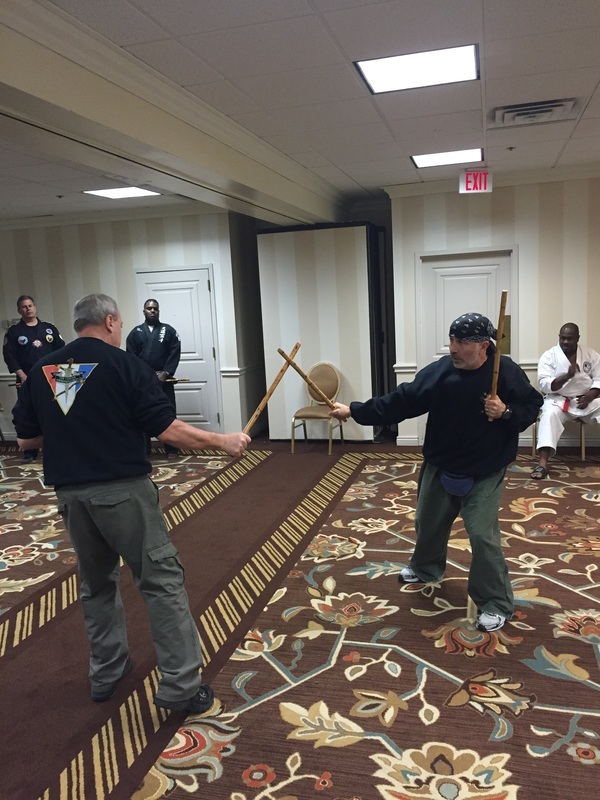 On April 17th and 18th, 2015 The Visayan Eskrima Guild was privileged to present, in two distinct seminar segments, aspects of the pillar arts of The Guild – Grandmaster Sonny Umpad’s Visayan Style Corto Kadena & Larga Mano Eskrima system and Grandmaster Angel Cabales’ Cabales Serrada Escrima system – to a receptive audience at the Genesis Martial Arts International 2015 Seminar and 1st annual Hall of Fame event. In attendance were four of the seven Founding Plank Holders of The Guild – Visayan Style Eskrima Masters Chris Suboreau, Keenan Williams, Wade Williams and George Yore. Present at this inaugural gathering were other martial arts Masters and Grandmasters like Bobby Barongan, George Elmer, Johnny Hunter, Keith Kugel, and, a host of others, who were either participating in, or taught classes at, this unique event held in the beautiful state of Rhode Island. On the 17th, an instructional seminar segment, exhibiting a definite Visayan Style influence, was headlined by Masters Chris Suboreau and George Yore, with Masters Keenan and Wade Williams in assistance. This group was presented with two subjects: a straightforward double stick, and, a concise single stick pattern. All techniques were presented in an easy to understand manner in order to facilitate on-site partner practice and solo recollection training. First up, was exposure to an intermediate level seven-count double stick pattern. Emphasis was placed upon technique execution linked to body angulation, the employment of evasive redirection maneuvers, spring loaded strikes, direct thrusts and sweeping slashes/strikes that can be used in a variety of combat ranges. Other key principles were taught, including non-telegraphic initiation, hidden hits within the pattern, evasion, correct anatomical alignment, and, target selection. Unfortunately, time constraints prevented deep discussion of these key elements. 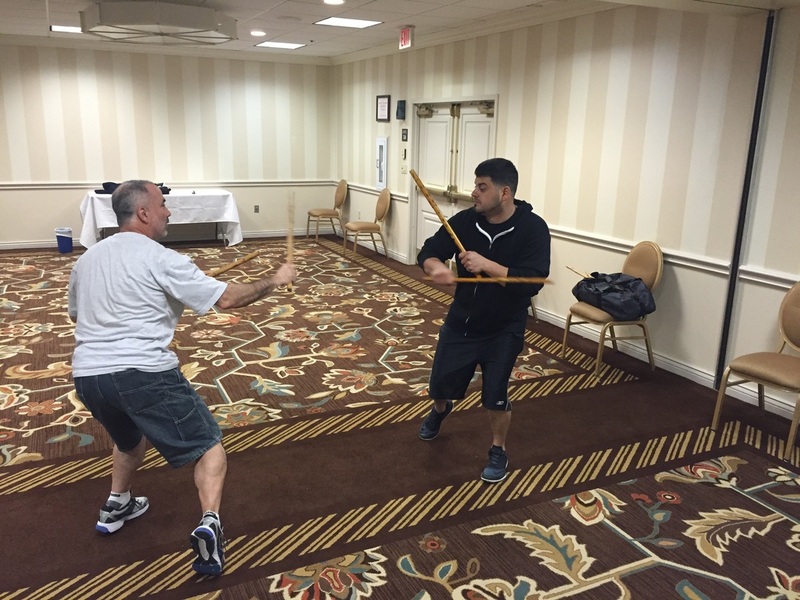 After the double stick portion of the seminar, students learned some of the system’s close range single stick techniques along with their supporting footwork and checking. Keen importance was placed on flanking the opponent, “live hand” orientation, and, the utilization of deceptive close quarter and medium range striking combinations. The crucial transition, the substitution of a stick, for a blade of equivalent dimensions, was covered at the end of this segment. On the 18th, an instructional seminar segment, exhibiting a definite Cabales Serrada influence, was headlined by Masters Keenan Williams and Wade Williams, with Masters Chris Suboreau and George Yore in the capacity of assistance. This class learned to counter two selected angles of attack, with a block, and, multiple counterattacks. Explosive movement, economy of motion, and precise targeting were key points to the successful execution of the series. The blocks were combined with perfect checking, footwork, and lightning quick strikes, in order to seize, and, maintain control of the opponent. Advanced concepts of zoning, alternative targeting, offensive and defensive flow, and reaction to the opponent's response, were offered up for consumption. All these elements were combined into a two-person flow drill across the floor. As a fitting conclusion to their segment, attendees were stunned into silence by the sheer mastery of a flowing advanced lock and block demonstration by the Williams family. The father-and-son team, in this exchange of blocks and strikes, displayed unbelievable power and speed. Their outstanding professionalism and obvious love for the art, as well as, an astute and enthusiastic group of students, made for an unforgettable experience. Students at the inaugural Genesis Martial Arts Hall of Fame were treated to a fantastic learning experience, highlighting various aspects of the Filipino martial arts, courtesy of The Visayan Eskrima Guild. The instructors of The Visayan Eskrima Guild saw to it that all participants had a grasp of FMA material that can be incorporated into their own arts. We warmly extend our thanks to everyone for their support of The Visayan Eskrima Guild. We look forward to working together with you again in 2016. In closing, we would especially like to thank our gracious host, Soke Keith Kugel, for his wonderful hospitality. Copyright © 2015 by Michael Davitt and The Visayan Eskrima Guild, All Rights Reserved.